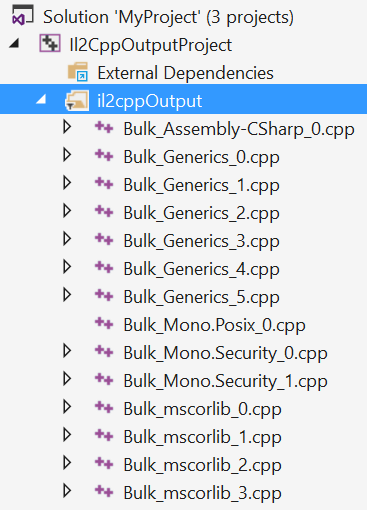 Il2CppOutputProject contains generated C++ code that was converted from managed assemblies. This project gets overwritten every time when built over it. See figure 2. See in Glossary, etc. This project gets overwrriten every time as well. The main project (it name matches your Unity project name). 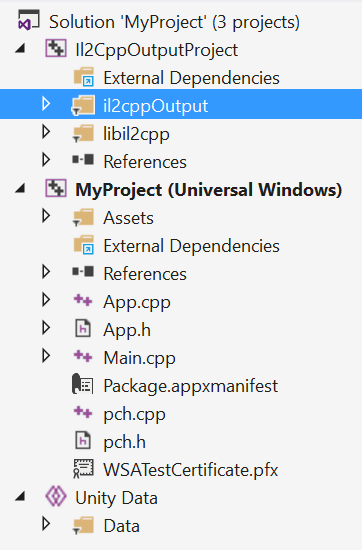 This is the project that will be built into an application package, which may be deployed to a device or uploaded to the Windows Store. Unity will not overwrite this project when built on top of it, so it can be modified freely without the fear of changes becoming lost. Debug configuration has all optimizations disabled, all debugging info preserved and runs much slower. It is used for debugging your game. See in Glossary enabled. This configuration is used for profiling your game. Master configuration disables the profiler, and is used for game submission/final testing. The build time of Master configuration might be longer, however, it is a little bit faster than Release configuration.